- Changes the pitch but not the length of a sound. - Large and easy to to use, ideal for experiments and live performances. - Full range adjustments from one semitone to an octave up or down. - Unique inertia parameters for springy vibrato effects. - Sample accurate changes prevent stepped pitch changes. - Phase locked for stereo sounds. - Buffer size changes, allows quality adjustments for vocal or percussion. - Great visual feed-back with semitone snap, and actual pitch indicator. * 64 bit Mac version now available. 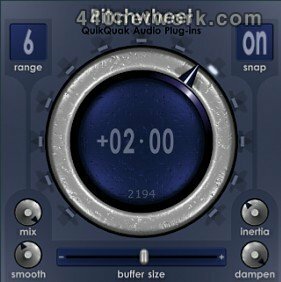 * MIDI pitch wheel disable toggle to prevent zeroing on host MIDI reset. * Additional wheel for independent timbre adjustments. * Completely change the tone of vocals and instruments. * New internal engine, with accurate percussive timing, without double hit artifacts. * New formant preserving algorithm, providing a stable and more natural sounding pitch change. 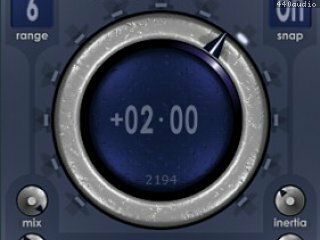 * Audio Unit bug fixes for mono to stereo routing and parameter range corrections. * Semitone shift accuracy increased. * Minor reduction in CPU usage. * Logic MIDI-effect type control working correctly. * A new pro quality pitch shifter! After months of research, Pitchwheel gets a new engine. * 'Fixed Envelope' option that preserves formant shapes. Useful for changing pitch without the usual 'chipmunks' sound. Allowing natural vocal changes, with glides, vibrato and harmonies. * 46ms (at 44k) latency - amazing response time for a high quality wide-band pitch shifter. * New option to only output sound when playing through MIDI, allowing 8 note harmonies to be played very easily. * Sample accurate pitch changes. * 96 semitone pitch range. * Halved latency down to 45ms for better live feedback. * Dail range now up to four octaves.